This remarkable, world-class set, is also offered individually on our Merkaba storefront. Earrings: Ultra fine GIA certified unheated Ruby and diamond earrings. The cushion Ruby pair on top weigh a total of 2.06 carats and the cushion Ruby pair on the bottom weigh a total of 2.29 carats as listed on the GIA certificates attached. The marquise shaped diamonds total 0.86 carats. These magnificent earrings are approx. 1 inch in length. Crafted by extremely skilled hands in the USA. Platinum. 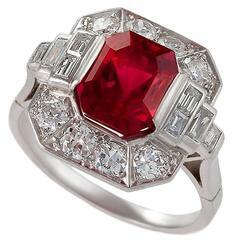 Ring: This exceptional, AGL certified, 5.05 carat cushion Burmese Red Spinel, is flanked by a pair of GIA certified heart shaped diamonds, weighing a total of 1.04 carats, and accented on the shank by a total of 0.26 carat round brilliant diamonds. 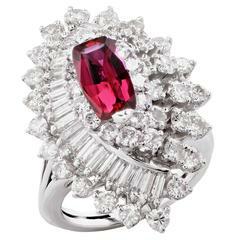 This ring represents the ultimate expression of love and is crafted by extremely skilled hands in the USA. GIA and AGL diamond and gem reports are attached. Please refer to the images enclosed. Size 6. Resizing is complimentary upon request. ***Returns are accepted within 7 days of delivery and will gladly be paid by us. 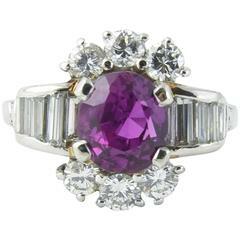 Rings resized upon request, may also be returned.